Any DVD Cloner Platinum is an ultimate DVD solution for copying DVD and ripping DVD. As a DVD copier, Any DVD Cloner Platinum can copy DVD movie to DVD and copy DVD to hard drive with 1:1 ratio in a super high DVD copy speed, shrink DVD9 to DVD5 with best quality, copy DVD to hard drive as DVD folder or ISO image file. 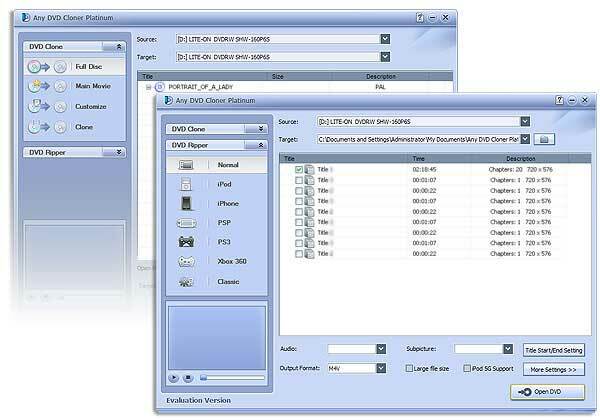 As a DVD ripper, Any DVD Cloner Platinum can rip DVD to M4V, MP4, AVI, OGM and MKV. ...... favorite DVD movie on the go! Qweas is providing links to Any DVD Cloner Platinum 1.14 as a courtesy, and makes no representations regarding Any DVD Cloner Platinum or any other applications or any information related thereto. Any questions, complaints or claims regarding this application Any DVD Cloner Platinum 1.14 must be directed to the appropriate software vendor. You may click the publisher link of Any DVD Cloner Platinum on the top of this page to get more details about the vendor.